Allergic Living’s primer on how to brighten your walls and your world – without the toxic VOCs. First published in Allergic Living magazine; to subscribe click here. The good news is that the paint industry is increasingly focused on creating less harmful products. But whether you’re buying old-fashioned latex, no-VOC eco-paints or natural alternatives, there is plenty you need to know before you get rolling. Head for your local paint or hardware store and you’ll find a dizzying array of paint choices, many of them labeled low-VOC or no-VOC. So what exactly does that mean? Volatile organic compounds, or VOCs, are a range of chemicals that perform a variety of tasks in products such as paints, solvents, cleaning agents and adhesives. But they all have one thing in common: they emit gases from liquids and solids at room temperature, and those gases can trigger a host of physical reactions, including asthma flare-ups, headaches, dizziness, skin irritation and more. According to Laureen Burton, a chemist and toxicologist with the Indoor Environments Division of the U.S. Environmental Protection Agency, most latex paints today use water as their basic solvent, with the VOCs as another solvent that helps carry other chemicals – the binders, pigments, anti-microbial agents and other components that give color, sheen and texture – to the surface being painted. Then, as the paint dries, those chemicals slowly evaporate into the air and, even after drying, that off-gassing can continue for an extended period of time. What many consumers don’t understand is that, even if you opt for a low- or no-VOC paint, as soon as you add color to it – especially the rich, saturated colors – or buy products with other additives such as binders, fungicides and anti-microbials, you may be substantially upping the load of VOCs. 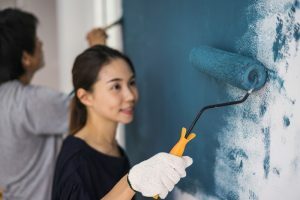 While paint often gets a bad rap for its chemical content, Eden Brukman, technical director of the Health Product Declaration Collaborative, says that the industry is a model for building manufacturers, because paint makers have learned to remove many harmful elements from their products without putting a serious dent in the quality. Among the companies she recommends are Portland’s Yolo Colorhouse, which makes premium zero-VOC interior paints without hazardous air pollutants, ozone-depleting compounds or other harmful chemicals. Of the bigger players, Benjamin Moore is renowned for its no-VOC Natura line, and other large companies such as Miller Paint and Sherwin-Williams have joined the Health Product Declaration, and they are pushing to do things differently. But Brukman emphasizes that people with asthma and chemical sensitivities need to look not only at the chemical content of the paints they are applying, but at all the materials that they’re bringing into their homes – because even if you use a range of products that are low-VOC, those volatile compound levels can add up. “In the ’90s there was a study done of a preschool in the Netherlands that was never occupied because it had sick building syndrome. And even after several years, they took samples of some of the surfaces and were getting very high levels of VOC readings because of all the different types of materials,” says Brukman, whose organization provides a venue for manufacturers to share information about their product ingredients and screens products for human health hazards. “There’s still a lot to learn about how these products that we’re putting into a single space interact, plus you’re dealing with the HVAC and a lot of other variables. You’ve spent hours staring at tiny paint chips and you’ve chosen the perfect shade of natural or no-VOC paint to color your walls. But how best to protect your health? Especially if you live in an older home, you should make sure the area you’re painting is lead-free, because sanding or scraping can disturb the lead, and painting over lead paint requires additional precautions. Simple lead testing kits are available at most hardware stores. When it comes time to start brushing, she recommends that you not only follow the manufacturer’s instructions, but that you consider going above and beyond – for example wearing protective equipment such as gloves, goggles and a mask, even when the manufacturer doesn’t specifically recommend them. 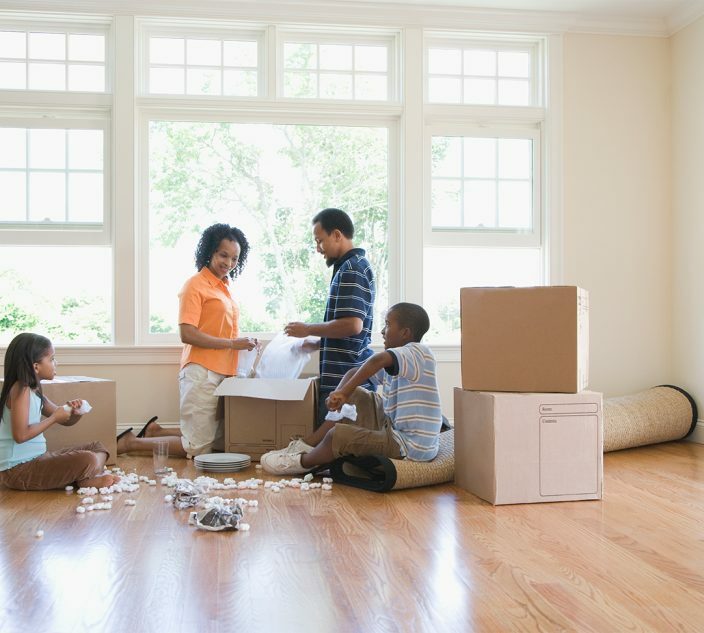 Plenty of ventilation is key, so paint when you can have windows open. A fan in the window pointing to the outside will help draw air out of the room. Also try to paint when the weather is dry – so if you’re in a region that experiences high humidity in summer, that means late spring or early fall. 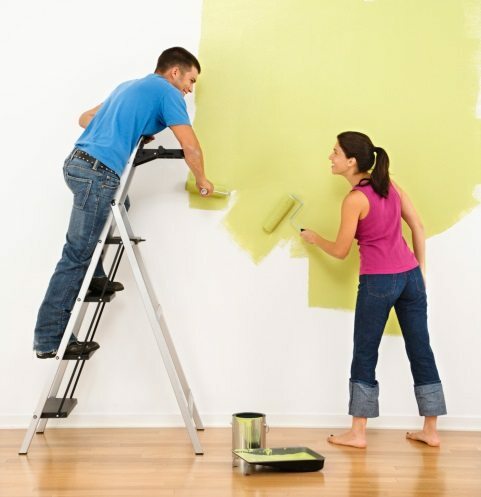 People with sensitivities to paint products should be kept away, and if someone starts to feel symptoms during the painting, the person should leave the area immediately. Even if you are using a natural product, Burton says you still need to follow the manufacturer’s instructions, and don’t assume that just because something is natural or less toxic, it can’t be harmful. “People do that all the time. ‘I’m using a natural alternative so I don’t need to open my windows, I don’t need to vent,”’ she says. Brukman adds that, no matter what paint you buy, there will always be trade-offs. Some might be a little (or a lot) more expensive; others might be harder to find; and some might not perform the same way as their more toxic cousins.